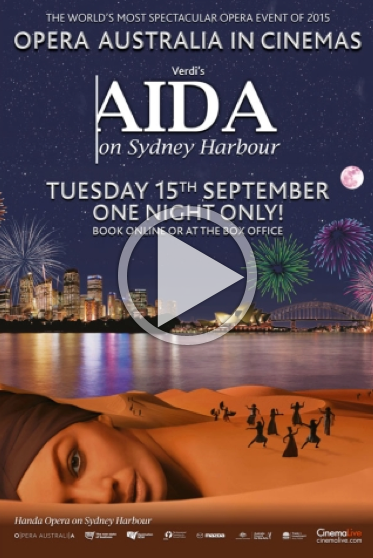 Verdi's Egyptian epic comes to Sydney Harbour in this new production screening live at Cineworld cinemas. Verdi's Egyptian epic comes to Sydney Harbour in this new production screening live at Cineworld cinemas. A rebellion is brewing on Egypt's borders, and for both the oppressor and the oppressed, loves and loyalties are about to be tested. Egypt needs a hero to lead their army against Ethiopia, and the High Priest has chosen Radamès. Egypt's fortunes will turn on his sword, but Radamès has a higher purpose. Through victory in battle, he hopes to win the hand of the beautiful slave girl Aida - handmaiden to the princess Amneris, and, secretly, an Ethiopian princess. As Radamès returns to Egypt in triumph, Aida is forced to make an impossible choice between her love for the Egyptian hero and her loyalty to her father and her defeated homeland. Long after the fireworks have faded over the spectacular setting of Sydney Harbour and Amneris sings her quiet, concluding prayer, you'll see the true mastery of this opera, which is both an historic epic and an utterly relatable human tragedy.